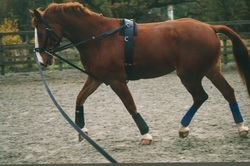 Sliding side reins are one of the most useful items of schooling equipment, and can be used either in ridden, lunge or driven schooling. 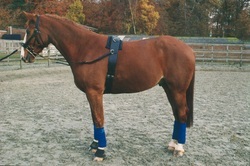 They encourage the horse to find its own balance, accept bit pressure and acquire a comfortable profile in all paces. As the name suggests the contact is a sliding one with the horse’s mouth, there is no forcing of the outline; the horse can alter its profile to comfortably suit the pace. The horses profile and level of head carriage changes as the paces change if you use a piece of schooling equipment that relies on a fixed position this can mean the horse is not as comfortable in all the paces. But sliding reins work on the principle of a sliding contact so the horse is able to comfortably adjust its head carriage whichever pace it is in. The only real resistance is felt when the head carriage is taken very high or the nose is poked far forward, the horse then feels a downward pressure into the mouth which should encourage the head to be lowered and the nose to come back to the vertical. As with all pieces of schooling equipment they rely on the horse maintaining a steady degree of forward movement it is not enough to put on a device and then let the horse slop around or alternatively move too fast and compromise good balance. 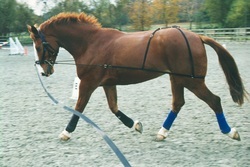 Side reins should not be used tightly to force a horse into a certain head carriage. If this is done the horse simply tucks its head into its chest without engaging the quarters or working the back properly and the stride becomes short and stilted. Once a horse has learnt to drop the contact with the bit it is very difficult to encourage him to take it up again as each time the rein is taken up the horse thinks it is correct to tuck its head in and drop the rein. You are always trying to achieve a state were by the horse reaches forward and seeks to take up the contact.